Telugu Titans suffered their eighth defeat of the Pro Kabaddi League season 6. 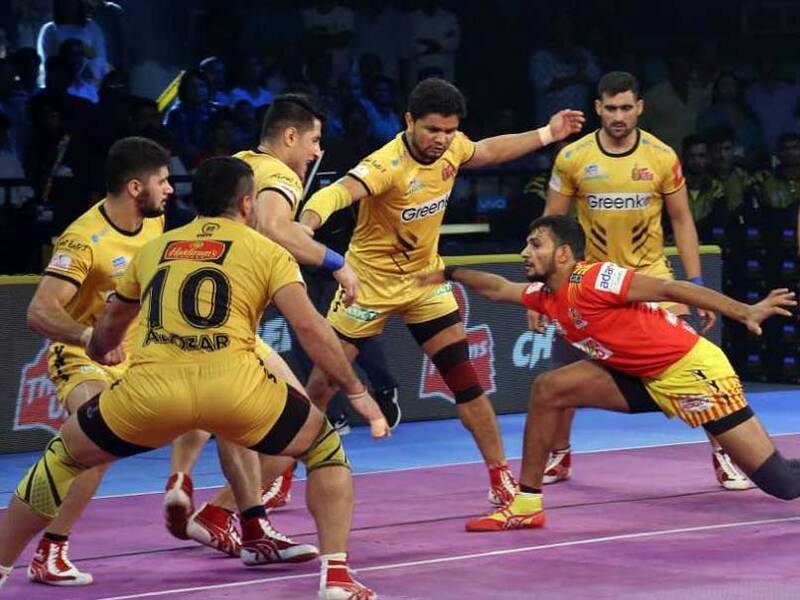 In an edge-of-the-seat match, Telugu Titans suffered a narrow 27-29 defeat against Gujarat Fortunegiants in an inter-zonal contest of the Pro Kabaddi League (PKL) season 6 at the jam-packed Rajiv Gandhi Indoor Stadium in Visakhapatnam on Friday. This was the eighth defeat for the Telugu Titans from 14 games, while Gujarat registered their 13th win from 18 games. Rahul Chaudhary collected eight points for Titans but it wasn't enough to guide his team home on the opening day of their home leg. Gujarat once again witnessed a fantastic show from K. Prapanjan and Sachin, who picked 10 and nine points respectively. Sachin opened the scoring for the visitors with a successful raid before the home side tackled Gujarat's Ajay Kumar to level the score 1-1. Nilesh Salunke and Sachin collected raid points in their respective attempts as the score read 3-2 in Gujarat's favour by the third minute. Both the sides traded raid and tackle points later as the score was once again levelled at 5-5. However, Rahul's super raid handed the Titans a lead for the first time in the contest as the home side led 8-6 and Sachin's failed attempt made the score read 9-6. The pendulum swung the other way as Prapanjan made some fantastic raids to once again give Gujarat a slight 11-9 lead. 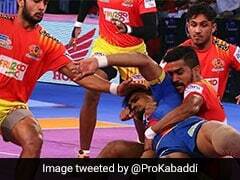 In the final minutes of the first-half, Gujarat inflicted an all-out to take a five-point 17-12 lead by the break. In the second half, Titans collected a couple of points to cut the deficit to 15-17 but some successful raids and tackles by Gujarat saw them stretching their lead to 20-25 by the 26th minute. Rakshith's super raid brought the Titans back in the contest with the score reading 20-21 in the 30th minute. Few minutes later, Titans inflicted an all-out to take a 24-23 lead and Rahul's successful raid with a tackle point helped them extend it further to 26-23 in the 36th minute. Prapanjan's two-point raid made the contest exciting again as Gujarat headed to 25 points but Rakshith also responded for the home side with a stunning raid to collect a couple of points and the score read 27-26 with just two minutes to go. Sachin's successful raid once again saw the contest being levelled at 27-27 before Gujarat tackled Rakshith in the dying minutes to pip the home side 29-27.